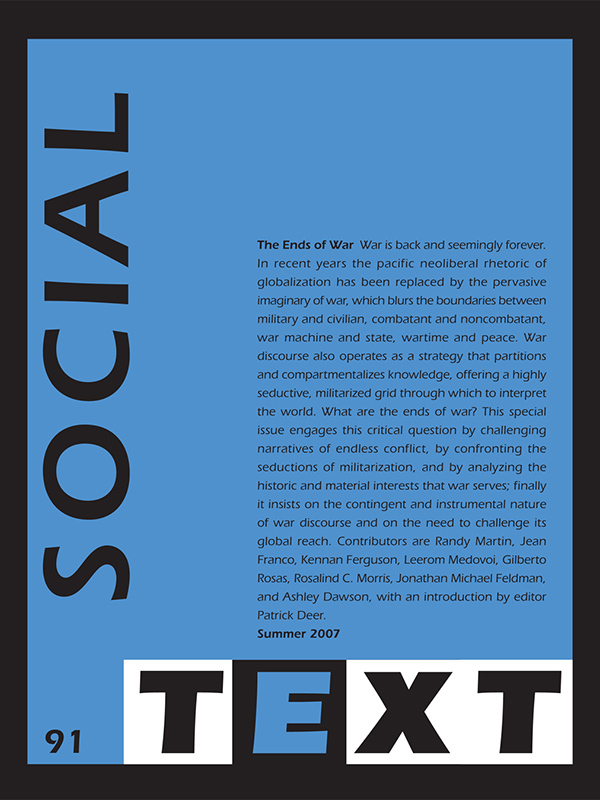 This special issue of Social Text examines the self-perpetuating nature of postmodern war and war culture. It looks at the instrumental nature of war discourse as a political force and challenges its vision of endless warfare as the means to control both domestic and foreign populations in an era of globalization. Essays analyze the historical and material interests that war serves and challenge the seductive mythology of high-tech precision warfare, which allows the traumatic effects of war to be considered at a great distance. The issue also argues that the increasing tendency to discuss war metaphorically—as in the phrases “War on Drugs” and “War on Terror”—blurs the boundaries between civilian and soldier and between combatant and noncombatant and defers the human cost of permanent warfare. The contributors to this special issue—drawing on cultural studies, anthropology, economics, psychoanalysis, gender studies, postcolonial studies, and war literature—target the blind spots in current debates about war. One essay examines the financing of war, challenging the myth that our military-industrial complex generates economic bounty. Another contributor addresses strategies of high-tech urban warfare now being developed by the U.S. military and warns of the historical limits of colonial policing techniques that build on practices of surveillance. Other essays discuss the eroticization of “consent” embodied in the practice of torture at Abu Ghraib; the paradoxes of paramilitary policing and popular resistance along the militarized Mexico-U.S. border; and the continuities between the permanent war economy that emerged in the United States during World War II and the current disastrous confluence of militarism, global outsourcing, and economic depletion.